It’s common knowledge that we need sleep to function. In fact, it’s estimated that humans spend up to one-third of their lives sleeping, which has a huge impact on our mental and physical well-being. While most normal adults get about 7 hours of sleep per night, that number can range from about 6 to 9 hours per night, so there is a little bit of leeway. You can get away with skimping on sleep once in awhile, but doing so regularly can negatively impact your well-being. For this and many other reasons, becoming aware of certain sleep disorders, like deep sleep disorder, is beneficial. If you are experiencing symptoms of deep sleep disorder, it’s important to seek a proper diagnoses so you can begin a method of management that works best for you. Here, you’ll learn about sleep, why it is so important for our well-being, and how a condition like deep sleep disorder might be overcome with a few simple adjustments. There are a variety of sleep disorders that can impact a person’s ability to get an adequate amount of rest. Since a sufficient amount of sleep is necessary to maintain good health, it’s important to determine what is causing your sleep disorder or deep sleep disorder. The conditions can range in severity with some related to other medical conditions. Things that can impact sleep include insomnia, sleep apnea, restless leg syndrome, and snoring, to name a few. Sleep consists of different cycles, all of which interact to help you achieve a sufficient amount of rest. Several things take place when you are in a deep sleep. Your organs detoxicate, your body renews cells, you build muscle tissue and your body works to heal wounds. People of different ages require varying amounts of deep sleep to function properly. Some studies advise that deep sleep should consist of about one-fifth of your overall sleep. If you typically sleep 8-9 hours, you may require a little less than two hours of deep sleep. Trouble with achieving deep sleep can have adverse effects on your health, so if you are experiencing deep sleep disorder, it’s important to seek answers. How Can I Achieve Healthy Sleep? 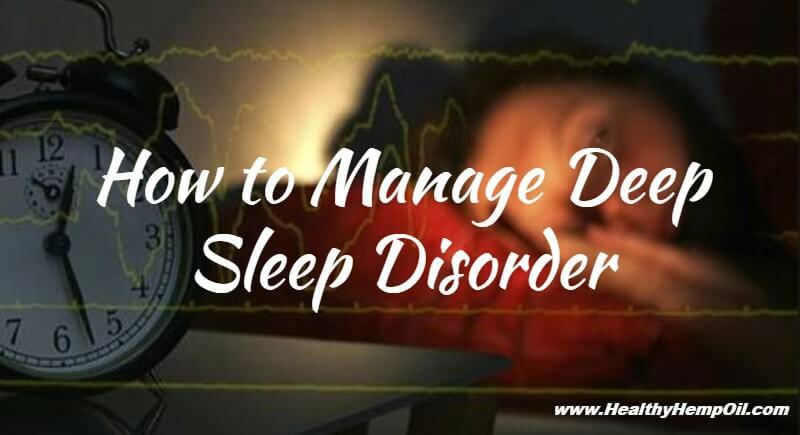 Managing deep sleep disorder is imperative for your health. There are a number of techniques you can practice to better your chances of having a good night’s sleep. These include a proper diet and exercise as well as certain things that can help you improve your overall health. There are also natural remedies that, when used in conjunction with a healthy diet, can do wonders for helping you sleep peacefully through the night. If you feel like your deep sleep disorder is unmanageable, it’s important to speak to a professional who can help put you on the right track. The following tips can help you develop a pattern of sleep that works best for you. Going to bed and getting up at the same time each day will begin a sleep routine to stick by, ensuring you get the rest you require. Disruptions to your normal sleep schedule can lead to insomnia, as can getting too much sleep on the weekends. Daily exercise of just 20-30 minutes per day can help you sleep better, but do take caution. Working out too close to bed time can disrupt your sleep. For best results, fit in your exercise about 5 to 6 hours before going to sleep. Coffee, soft drinks, teas and diet drugs typically contain caffeine, which can interrupt your sleep. Things like alcohol also negatively impact a person’s ability to achieve deep sleep due to the effect on the brain. If you are having problems getting enough rest, it’s best to minimize your intake of these particular substances. Even smoking has the potential to interrupt your regular sleep schedule, as nicotine withdrawal tends to wake smokers at early hours of the morning. Factors you may never have considered may be to blame for your sleep troubles – even having your pet sleeping in bed with you. It helps to unwind after a long day, as the stresses of everyday life can definitely take a toll on your mental health. Relaxing activities before bed, such as listening to an audiobook, can help you fall asleep more easily. Including these in your routine before bedtime can benefit your overall rest. Taking a hot bath an hour and a half to two hours before sleep can have positive results. Other activities, like wearing pajamas and giving yourself a calming massage can do wonders for resting your mind and body. Certain scents, like lavender, have also been known to promote relaxation and a satisfying rest. Be open to these types of adjustments in your quest to achieve a healthy sleep schedule. Lying in bed while you can’t sleep might make it difficult to get to rest as anxiety can exacerbate insomnia. Try other activities, like listening to music, to make yourself tired. Other factors, like room temperature, can negatively impact your sleep. Pick a comfortable temperature, and stick to it. Everyone deserves a good night’s rest. If you feel like your sleep patterns are becoming detrimental to your overall health, or if you are experiencing panic attacks at night, speak to your physician, or consult a sleep clinic that can help diagnose and help you manage your symptoms. There may be a simple explanation for your sleep troubles. Do you experience trouble falling asleep? What steps do you take to ensure a good night’s rest? This entry was posted in CBD Health Benefits and tagged CBD & Sleep, How To's.